Nagpur: Love is in the air with a sense of scare… Every Valentine’s Day the situation remains the same in Nagpur. 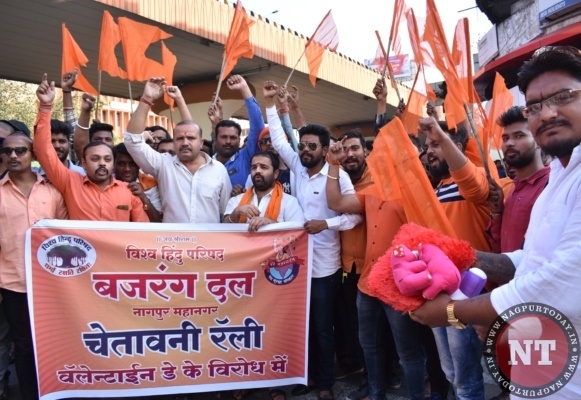 The so called moral police, which come out in the form of saffron outfit Bajrang Dal, have again taken out the rally (warning rally as they called) on Wednesday across streets to signal alert for all those blooming in the air of love. As the public places and the famous love dens are haunted by the hooligans, Nagpur lovers have taken to social media sites to express their feelings towards each other. However this year, the police bandobast is unprecedented as over 400 officers and employees have been deployed at various sensitive places to bar anti-social elements from disrupting law and order. The prominent sites under the eagle’s eye are Telangkhedi lake, Seminary Hills Garden, Ambazari Garden, Botanical Garden and many other hot dating spots in the town. So it means the lovers are watched everywhere, either by cops or antagonists. However, as they say love knows no boundaries, it has gotten bolder back home too. While on one hand there are hooligans lauding their angst against what they call ‘western culture’, there are many who supports the undertone of Valentine’s Day ie purely love. The city youths this year have given the message loud and clear – love is not all about boyfriend-girlfriend, it is eternal and it’s universal. So there is nothing like East or West when it comes to expressing love towards each other, feels Shrishti who is pursuing engineering at a prominent college in Nagpur. On the eve of Valentine’s Day many young at hearts gathered at Futala lake, waving heart shaped balloons and standing united to support the celebration of love.